The violinist cradles his instrument beneath his chin, and as he deftly draws the rosined bow across its strings they begin to sing. His fingers dance across the fretboard with mathematical precision. He coaxes emotion from wood and sinew. It vibrates in the air around him as he listens, thinks and acts in a cycle of purpose and meaning. The gamer embraces her controller as she guides her armored avatar through Rainbow Six Vegas. The tips of her thumbs gently nudge the analog sticks and her fingers snap down over buttons and triggers. She wonders, watches and responds as the image on the screen before her twists and turns. The controller pulsates and rumbles in time with the staccato gunfire that emanates from the speakers. Process, imagination and emotion intertwine. In each case, the world around them disappears as they succumb to the union of action and reaction generated by their unique relationships with these devices. One plays a musical instrument. The other plays a video game. But, in the end, they're both playing. Audiosurf recently brought to my attention the similarities between playing music and playing games. It's a simple, casual game where you control a little ship as it rides down a linear track, colliding with colored blocks. It is, in a sense, Tetris on a track, except the approaching blocks are all one size and must be stacked by color, rather than shape. But what makes Audiosurf special is the way it incorporates music. Audiosurf builds every track from an mp3 file of your choice. Hip-hop, chamber music, jazz, classic rock, spoken word - any audio file will do. 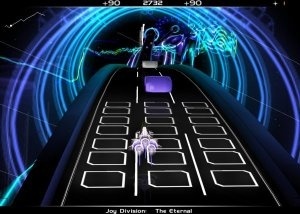 The ship's speed ebbs and flows according to the beat, and the colored blocks ride across different lanes of the track in patterns influenced by the music's rhythm and instrumentation. The tempo, dynamics and tonal variations of the audio source are all incorporated into each track in amazing ways. As the ship slides across an undulating ribbon that twists and bends through space with the music, surrounded by luminous shapes and explosions of light, the effect is absolutely hypnotic. At one point I found myself under the illusion that, through the simple input of steering the ship from lane to lane as it glided down the pulsating track, I was somehow in control of the music. I've experienced a similar sensation when playing other music or rhythm-based games. Elite Beat Agents, for example. And Rez, Lumines or anything else by Tetsuya Mizuguchi, for that matter. There's a melding of input and response in such games, especially apparent at higher difficulty levels, that starts to feel strangely like bonafide musicmaking. It's a breakdown of the division between player and game, where button presses seem less like timed responses that merely keep the song going, and more like the actual source of the music. There's no better example of this phenomenon, of course, than Guitar Hero and Rock Band. Not only do gaming's dual rock offerings attempt to replicate the feel of playing music, they do so via replicas of musical instruments. The effect is mesmerizing, and amplified by the visual representation of music as a steady shower of notes that burst to life as they reach the bottom of the screen. There's something intoxicating about music made visual. Once you've played either game, you can't sit in the same room and watch someone else play and not stare at the steady rain of sound. Your brain processes the combination of sight and song and you imagine your own fingers working in response to each note. I'm sure most musicians would agree that making music involves recreation, reverie and escape, whether accomplished though improvisation or by following notes across a page. Hand any child a musical instrument and they will gleefully make noise and eventually create songs. Musicmaking, like gaming, is inherently playful. But the word "play" implies more than recreation. To play also means to use, or exploit, to one's own advantage. It's what the musician does when he bends an instrument to his will, demanding a melody from its otherwise silent form. And games are tailor-built for exploitative pursuits. They allow enemies to be killed and worlds to pillaged with characters that respond with puppetlike obedience. Video games, like musical instruments, are tools created to serve the psyche according to the desires and intentions of the user. I don't hold Gears of War curb-stompings in the same high regard as I do accomplished musical performances. And I'm not trying to directly equate the talented efforts of musicians with the recreational activities of gamers. But I wouldn't be surprised if the bloom of colors depicted in a PET brain scan image of a pianist looked surprisingly similar to that of a Halo player. The union of action, thought and sensory experience that games offer is, like musicmaking, something special and unique. Someday, music may not be the only universal language.